Israel’s Elbit Systems soars in the international market with a new agreement with Boeing to market the company’s Hermes UAVs. Israel’s Elbit Systems has soared into the international market with a new agreement with Boeing to market the company’s Hermes UAVs, American military and defense media reported Monday. The companies have signed a Memorandum of Understanding at the Farnborough Air Show in London. 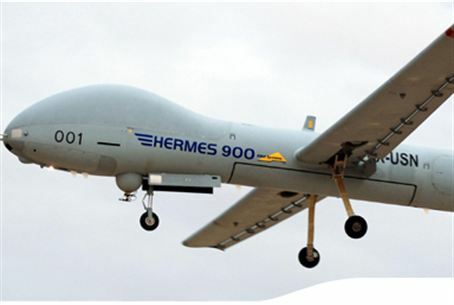 The agreement covers marketing and sales of Elbit’s Hermes 450 and 900 UAS product lines. The agreement gives Elbit a long-desired stronger foothold in the U.S. market. Its Hermes 450 UAV are exported to several countries, including Britain, Singapore, Georgia and Brazil. It also is a principle part of the IDF’s counterterrorist operations. The larger Hermes 900 can carry larger payloads for extended missions and is often used for ground support and maritime patrol missions. “This partnership further expands and enhances Boeing’s longstanding relationship with Elbit Systems to include unmanned products,” said Debbie Rub, Boeing Missiles and Unmanned Airborne Systems vice president and general manager. She said the Hermes UAVs will help Boeing supply needs by the United States and its allies. Boeing and Elbit recently announced other strategic agreements relating to advanced fighter avionics and long-term cooperation providing helmet-mounted display sights for all Boeing’s fighter planes. Boeing earlier this year chose Elbit's Brazilian subsidiary to provide large cockpit displays for the F-15 and the F-18 fighters.